One of my favorite times of day during the workweek is when I am able to settle down onto my cozy sofa in the evenings and pick up my knitting. Just picking up my pointy sticks immediately brings me to a place of meditative calm, a place where I hear the whispers of my deepest creative dreams. I love getting lost in the yarn-y world of color and texture. One of my latest projects, a linen stitch neck cowl in oranges and browns, was inspired by Jane Thornley’s Winter Forest Evocative Guide. 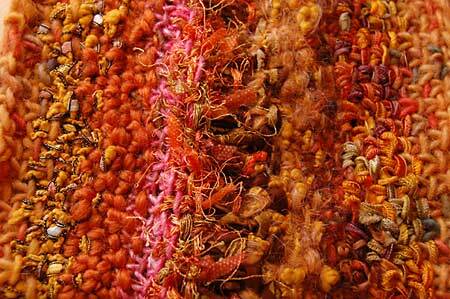 A couple of summers ago, I shared some yummy batiked fabric here. 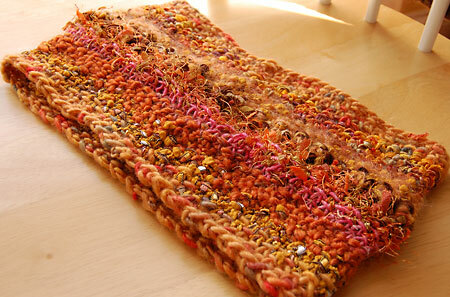 To add extra texture to my cowl, I found myself ripping off thin strips of the “seed pod” fabric to add to my knitting. What a great idea, Jane! 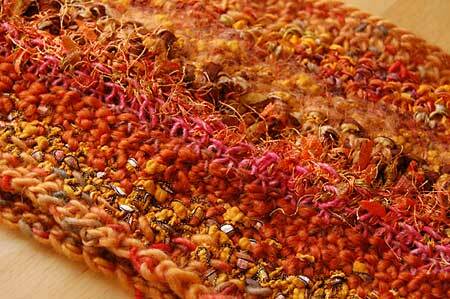 This is a fabulous little piece that knits up easily and is perfect for jazzing up a solid colored shirt or sweater. Next up: a feather and fan wrap whose colors speak of sea and sky. This entry was posted in Color, Creativity, Fabric, free range knitting, Inspiration, Knitting, My Studio, Photography and tagged Jane Thornley pattern, knitted cowl, Winter Forest Evocative Guide. Oh Karen!!! That is so beautiful.. It’s like sunshine. Love it. The cowl is wonderful. I just want to run my hands over it. It reminds me of the colors and textures of the west. Thanks Susan, it was so much fun to create! 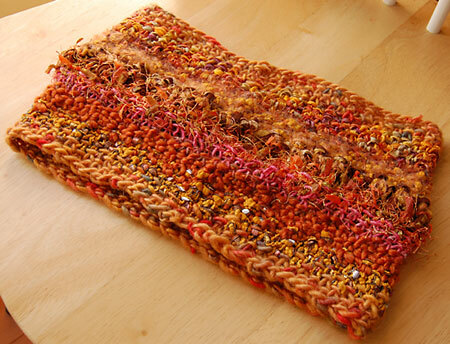 Love your cowl Karen and your blog! I can’t imagine that I had never seen it til now!